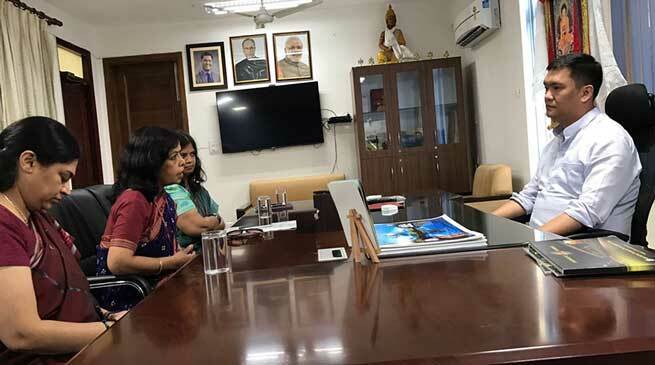 Chief Minister Pema Khandu in a meeting with Secretary Tourism Government of India discussed various issues relating to promotion of tourism in the state. Union Tourism Secretary Rashmi Verma had called on CM today at latter’s Delhi office. While seeking Government of India’s continued support to make tourism an industry for employment generation and economic growth, Khandu advocated for introducing concept of forest rest houses involving indigenous technology. He informed the union secretary about the initiatives undertaken by the State Government to boost tourism sector in the state. “Home stay facilities are being encouraged through various self employment schemes”, Khandu disclosed. “Arunachal Pradesh is rich in natural resources with dense forests, large and small river systems nesting the land and is a treasure house of flora and fauna. Marked by diversity in customs, cultures, traditions and languages, the state can be truly considered to be at the biological and cultural crossroads of Asia” advocated Khandu. Pema Khnadu said, Arunachal has all that can attract tourist from the globe. While speaking about adventure tourism, the chief minister said that the state government is focusing much on adventure tourism for which adventure tour providers are being encouraged besides proposing for eco-tourism resorts in select locations. National Institute of Mountaineering and Allied Sports (NIMAS) at Dirang is doing exceptionally well in this field, informed CM. Verma assured cent percent support to Arunachal Government and said that the ministry of tourism shall extend all possible assistance in marketing and getting tourists for the state apart from other supports.